Motor Sport Japan is an event held to give the city folk of Tokyo exposure to the motorsports world.Â Starting in 2006 and has been increasing in popularity since, the tally for the two day event was over 130,000 people last year. 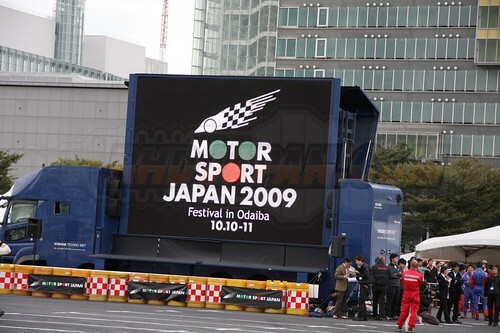 The fourth annual Motorsport Japan event was held last weekend (October 10/11). Put together by the domestic auto makers, race teams and JAF with the concept of letting the event-goers 'see' 'hear' and 'touch' the results of over 50 years of Japanese motor sports evolution, it is a great event for the senses. The event is setup for the spectators to see and hear the high horsepower machines from the Super GT, F3, WRC, F1 upclose in detail.Â The opportunity to caress a couple of the high quality parts which put racing machines together along with the scent of the racing fuel and tires burnt during demo runs also added a great touch to the event. Given the small area of the Odaiba parking lot the demo runs weren't as spectacular as say, the D1 and MSC drift events however being able to hear the raw sound of the engines powering these powerful machines in their raw form is always a treat. It is unfortunate that we cannot share all of the sensory joys of the event but we would like to share some of the visual aspect with the pictures taken. Hopefully some of the forum members will enjoy the pictures and even mark the calender to make it out during next years event! One great attraction for was to get to see Lexus's upcoming supercar, the LF-A in action. The one featured by Toyota at the event was the same LF-A seen tracking around the Nurburgring. (I was half hoping for a close-to-production ready concept, but I guess I will have to wait for the upcoming Tokyo Motor Show.) Its V10 wasn't as impressive as the say the F1, Super GT, and F3 machines exhibited that day (obviously), but it looked easy to maneuver by the driver and seemed very light in its movements around the exhibition lot. Another highlight for me was seeing the Honda FCX Clarity, which, if you watch Top Gear was featured and considered by James and Jeremy to be the true car of the future.